Recognising deafblindness as a seperate and distinct disability is a vital first step in ensuring that people get the services and supports they need. Ratify the UN Convention on the Rights of People with Disabilities (CRPD). The CRPD recognises deafblindness as a distinct disability. Ireland signed this convention in 2007 but is one of only two EU countries that have not yet ratified it. Develop guidelines for the care and support of children and adults who are deafblind , similar to those published in the UK: In the UK and other countries, local authorities are required to identify, make contact with and keep a record of all the people who are deafblind in their catchment area; ensure assessment of needs for care by a person or team that has specific training and expertise relating to people who are deafblind; ensure services are appropriate and that there is a director-level member of the local authority senior team who has overall responsibility for deafblind services. That health and social care sectors are required to record data on gender, ethnicity, socio-economic status and co-existing conditions of people with deafblindness. A proactive approach by the Irish government is vital as deafblindness is a growing concern: In 2011, research showed that there were 10.365 people with both hearing and vision impairments and the proportion of the population who experience a combination of vision and hearing loss is expected to rise dramatically as a result of the ageing demographic and increased survival rate for infants with multi-sensory impairments. Visiting the clinics of local councillor’s andTD’s and raising these issues. Advocacy is central to the work we do and our aim is to generate momentum for recognition of deafblindness as a distinct condition. We aim to do this by increasing political commitment to the inclusion of the condition of deafblindness in public policy as well as commitment to the mobilization of resources for the provision of deafblind specific supports and services. We will achieve our aims by working in partnership with those who are deafblind, their family members, carers, service-providers and other interested parties. Representative advocacy usually involves an advocate supporting a person to claim their rights or entitlements. This include access to services such as education, health, employment; legal rights; making complaints, etc. Self-advocacy is when a person speaks up for themselves. This can be achieved alone or as part of a group. We facilitate an Advocacy Working Group which meets four times per year. 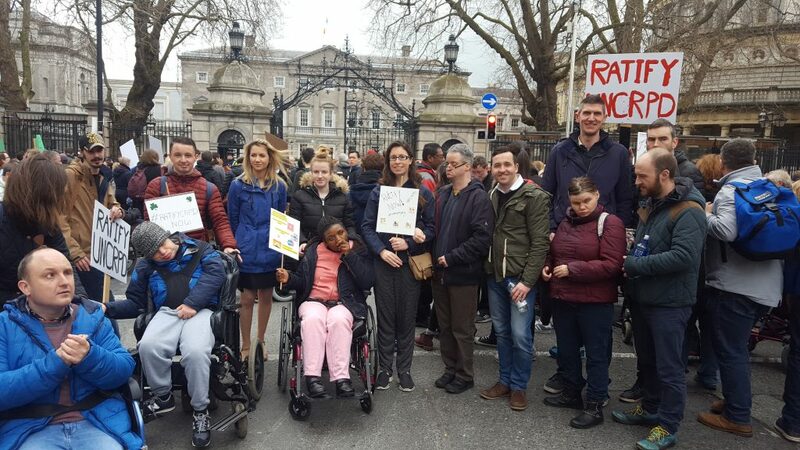 The overall purpose of the working group is to provide a platform to guide and co-ordinate our inputs in the design and implementation of strategies to increase resources for those in Ireland who are experiencing deafblindness. An Irish Sign Language (ISL) interpreter is provided at each meeting. Persons with combined hearing and vision impairments are encouraged and supported to attend these meetings. Ensure that the advocacy work undertaken by us is well-informed and in line with the real needs of those who are deafblind in Ireland. Participate, where agreed, in advocacy activities of the Anne Sullivan Foundation. Policy advocacy involves influencing changes to laws, policies and practices that discriminate against people with a disability. We participate on groups and committees monitoring government policy and have established our own Inter-Agency Policy/Advocacy group comprised of representatives from organisations supporting individuals who are deaf, blind and deafblind. An interpreter is provided at these meetings. Ensuring early intervention for deafblind adults and children by a deafblind Consultant Specialist. This is cost-effective in the long run. Ensuring better understanding of deafblindness by health and social care practitioners as well as those with responsibility for education. Ensuring the development of a system that collects data on the population of deafblind people. (A good example is The National Child Count of Children and Youth who are deafblind in the US). Ensuring information and training in augmentative communication methods is provided for people who are deafblind, their family members and professionals supporting them. Increasing financial assistance to purchase adaptive equipment (ramps, mobility aids etc..) and assistive technology (screen readers etc.). Ensuring recognition among the State and public/professional bodies of Irish Sign Language (ISL) and augmentative and alternative forms of communication (such as tactile signing/objects of reference/PECS ) as formal communication systems. Ensuring further research into the area of deafblindness which includes greater consultation with people who are deafblind.